I think many Club members looked on last week as a significant Dorset Hamilton from Dorchester made just over 1K on Ebay. The C 1840/50 Hamilton used by Frouds Dorchester was keenly chased and secured by a club member . 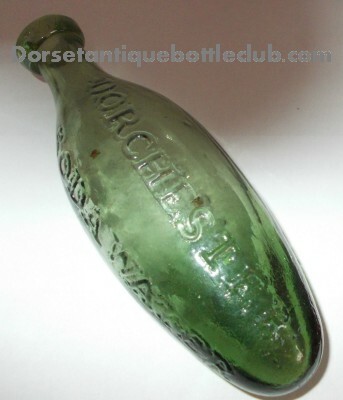 In fact it was a interesting week as another Dorset Mineral Hamilton type Barret and Elers stick stopperd bottle originally used by Edwin Roberts of Shaftsbury also made low hundreds. 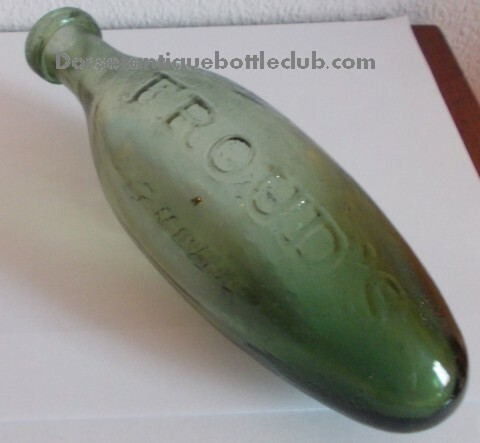 This was significant as of the ones in collections it was the first to retain it’s stopper and shows that Barret and Elers tried to persuade bottle users to use their patent stopper by using the then most popular form the egg ended/ Hamilton bottle. Hiram Codd did exactly the same thing with his Codd Hamilton Hybrid types. This entry was posted in News, and tagged Mineral water. Bookmark the permalink.